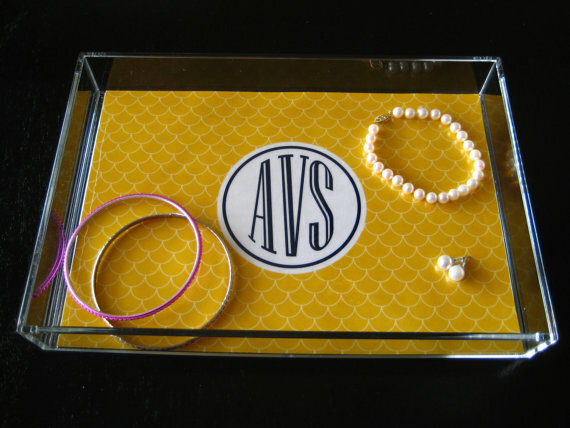 monograms and prints and trays, oh my!!! If there is any Southern in your blood, you inevitably have an insatiable desire to monogram each.and.every.thing.you.own. None other than (Tennessee native) Southern belle Reese Witherspoon has said it better: "My rule is, if it's not moving... monogram it." Honeycomb is the loveliest of graphic patterns right now! Mandy's trays are in a myriad of beautiful patterns and colors. Shower your BFF with a tray in her wedding colors, or win the best-bride-ever award by gifting your bridesmaids with something they'll actually USE: a lovely monogrammed tray in their favorite hues! Scallops are my personal favorite! This would be perfect for serving birthday party cupcakes or displaying gift favors, too! BONUS: She even has a DARLING "Happy Birthday" tray. For those of you with children (or just an ageless sense of wonder! ), this would be perfect to present with a birthday biscuit (complete with a lit candle and singalong!). DISCOUNT CODE: Use the code "openingday" to get 20% off anything at her Etsy shop! Congratulations for launching this new branch of business, Mandy!! !